When I travel, I really want to focus on tasting the most authentic and delicious local food that each destination has to offer. Look, I can get delicious Italian, Thai, Mexican food right here in Los Angeles, when I'm in Hawaii, I don't plan on eating anything but food that is hard to get back at home. It might be because I'm Taiwanese but I'm definitely partial to plate lunches, which are so good in Hawaii! We have something that's kind of similar in concept, its called a Bian Dang or a Taiwanese bento. Many of these local restaurants below feature delicious plate lunches!​ They are also mostly hole in the wall restaurants that only take cash. These local spots are the real deal! ​The Koloa Fish Market is a required stop when you are on the island of Kauai! It's a small spot and usually very crowded but trust me, you'll want to wait in line for this. Try to go on off meal hours for shorter lines. They serve every kind of poke combination you can think of, and no this poke doesn't taste like all the poke restaurants that are proliferating in the United States. This is the real deal authentic stuff. I'm a plate lunch queen and they serve it up right at the Koloa Fish Market! Hawaiians know how to make this girl happy. Pork wrapped in taro leaves, poi, rice, taro macaroni salad, taro dessert, and taro smoothie. ​2. Hanalei Taro & Juice Co. This little food truck features delicious local ingredients. Their food has its own unique flavor, tasting different from the plate lunches of Honolulu. They serve generous portions, piled high with goodies and you can eat your lunch at the tables and benches set up right next to the truck. If you are looking for high quality farm-to-table Hawaii food, check out Hanalei Taro & Juice Co.
Like many of the best restaurants in Kauai, this is a family owned business that serves the ultimate Hawaiian comfort food. They've been in operation for 100+ years so you know that they are good! This is a busy spot so don't surprised if there is a bit of a wait. As is the case with most popular local spots in Kauai, its definitely worth the wait. The food is consistently delicious and the restaurant is set up diner-style. This is an especially popular breakfast spot with a huge menu. Mark's Place serves up delicious Hawaiian food at bargain prices. Like most of the best local food in Hawaii, its a little hole in the wall spot. Also family owned, it has a simple, basic menu so you won't get confused. You can easily enjoy a great meal for two for $25 which is a bargain compared to many spots. The portions are generous! Pono Market features a great selection of food and are known for their super ONO plate lunches. They also have poke bowls available and packaged sushi. It's a super casual spot, drinks are located in a cooler, order you meal and enjoy it in the beautiful Hawaiian weather at the tables outside. Pop into Bobbie's if you want a delicious plate lunch and super friendly service with a smile. Opened in 2004, the restaurant is family owned and everything served is made from scratch, even down to all the sauces and marinades. They are known for their 11 bento type lunch boxes. The fried saimin is pretty delish, it is tossed with bacon and is richly flavored with dashi. This delicious little spot is cash only. Totally onolicious! ​Lihue Barbecue Inn's food is super ohana, its been open since 1940 and the locals are passionate about it. 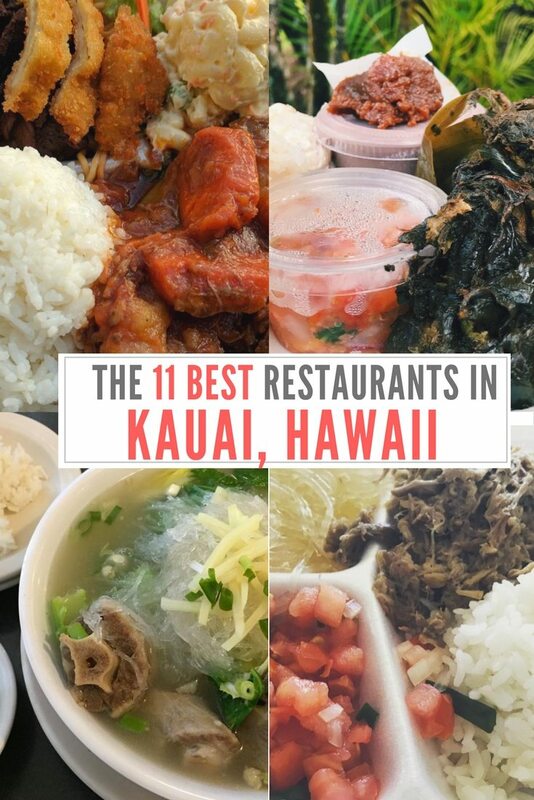 You can get super traditional Hawaiian, Japanese or Asian food, or grab spaghetti or a burger and fries.​ What I super love about the restaurant is that its a complete meal, with an appetizer, the entree and sides AND desert. The prices are totally affordable and everything is delicious and ono. Saimin is a delicacy that is distinctly Hawaiian so you definitely have to stop by Hamura's Saimin​ whenever you're in Kauai. It's a Hawaiian version of ramen and the noodles here are homemade. You can even purchase the noodles on their own to take home. Locals love 'The Special' featuring all kind of tasty goodies including spam, wontons, pork, bok choy, boiled egg, kamabuko and more! There's usually a line so make sure to come early! This spot is still a bit undiscovered by tourists, it's filled with locals. The Waipouli Deli & Restaurant features Hawaiian and Japanese style comfort food. We definitely recommend that you stop by for breakfast. This restaurant is popular due to word of mouth, its home cooking at its finest. Make sure to check out the Oriental Plate, a plate lunch type meal that features BBQ steak, fried chicken cutlet, shrimp tempura and noodles. I love that you can choose different sizes for different appetites, entrees are available in large, half and rice bowl. Ono family restaurant features that hearty Hawaiian-style comfort food that puts you into a food coma. This restaurant features a large menu and everything we've tried on it is delicious. It's a super popular breakfast spot and you'll usually encounter a wait in the mornings. There's also a shaved ice stand thats part of the restaurant if you are looking for a frozen treat to end your meal! I know I know, Da Crack features Mexican food, which goes against what I said about staying Hawaiian on your visit to Kauai. The locals totally love this spot though and it definitely has a Hawaiian spin on the Mexican dishes. The servings are massive and the ingredients are fresh. They use brown rice instead of white and the beans are vegan. Love the wasabi cream on the fish tacos and there are lots of shrimp dishes.